What is the recommended age for vaccinating the piglets on a farm with a moderate PRRS virus outbreak? Can we know the world distribution of PRRS disease? Have studies been carried out in Africa? Neonatal diarrhoea problems in piglets in a PRRSv-positive farm. Which can be the causes and what actions can be implemented? Can the sows routinely vaccinated with PRRSV MLV transmit seroneutralizing antibodies to the offspring that can interfere with active immunity after vaccination with the same vaccine in early stages? What is your opinion about PRRS vaccination at seven days of age on the production line? Do people who handle pork represent a risk for the spreading of PRRS or other diseases if they enter in a swine farm? What protection percentage do PRRS vaccines provide? Must we always isolate the replacement animals? How much time is needed for ‘cleaning’ a 150-sow farm? 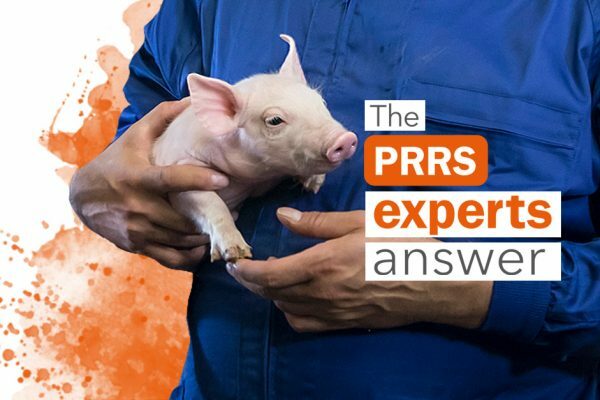 On a PRRS unstable farm with a mass vaccination (4 times/year) programme for PRRS and 3 times/year vaccination programme for Aujeszky´s disease, both for sows, we want to minimise stress due to vaccination, what do you recommend? Is it possible to administer a live vaccine to animals already infected to stop the piglet’s infection?